Exploring Magnets is one of my favorite units to teach in Science! This year, we've been working really hard to integrate Social Studies and Science into all our Math and ELA Common Core Standards. 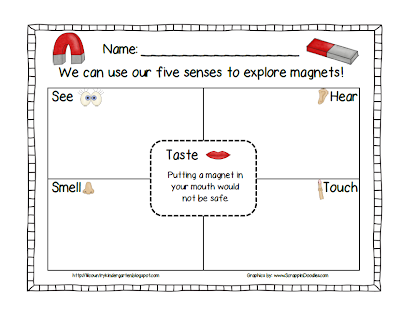 So, for my formal observation I decided to center my lesson around using our five senses to explore magnets. My kids had explored magnets the day before, used them around the room, made observations, watched iron shavings being pulled across paper and all those other fun things you get to do with magnets. I thought the kiddos would have been a little less excited on the second day, but did I ever underestimate my kiddos! We read the book Magnets Push, Magnets Pull and used bar magnets to use our five senses with the magnets. Although they were totally engaged in the lesson, the majority of them were talking over each other to answer my questions. Yikes! :) I haven't gotten to have a conversation about the observation with my Principal yet, but hopefully, it wasn't too crazy! Here's a copy of the resources I created in case you'd like to use them, too! Just click on the picture to download your freebies from Google Docs. The first two pages are student response sheets (color and black/white). I used the color version with our projector. The other pages are signs for a large anchor chart with student responses. Here are a few other magnet ideas I found. This is wonderful! I'm going to be teaching magnets to my kids over the next few weeks and you just saved me so much time, thank you so much for sharing this! I'm your newest follower! I'm just starting a blog and I'd love for you to stop by sometime if you get the chance! Thanks, Melissa! I'll have to check out your blog soon! Thanks for including the link!